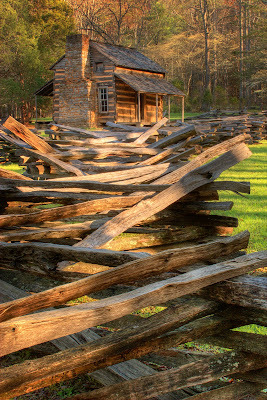 Cades Cove is one of my favorite places to photograph. The park service has preserved original homesteads and churches, and they make good photographic subjects. I usually don’t know how a particular site will look until I get there, so I just move from location to location, until I find something I like. On this morning, I arrived to find the John Oliver cabin bathed in golden early morning light, and I knew I was in the right place at the right time. In this image, I chose to place the fence in the foreground to draw the viewer’s eye into the photograph, leading it to the cabin. The fence also serves to frame the cabin. The surprise was the beam of light that streaks across the fence, also leading the eye to the cabin. The dogwoods in the forest are subtly illuminated, providing a nice touch of balance to the photo. The criss-crossed diagonal wood beams, and the shaft of light add energy and visual tension to this otherwise peaceful scene. This photo was a finalist in BetterPhoto.com’s contest for February, 2010. HDR photo from three images processed and tone-mapped in Photomatix Pro. Canon 20D f/22 ISO 100 28-200mm lens @35mm To purchase this photo, click here.